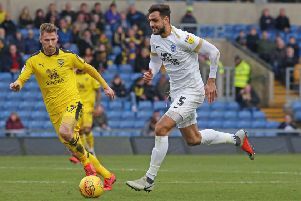 Peterborough United manager Grant McCann raved about skipper Chris Forrester’s performance in today’s (January 2) 1-1 draw with Scunthorpe at the ABAX Stadium. And with good reason. Forrester was outstanding in midfield against high-flying opponents. Posh centre-back Ryan Tafazolli competes in the air with Scunthorpe's Charlie Goode. Photo: Joe Dent/theposh.com. The Peterborough Telegraph was also impressed with the dominant defensive display of Michael Bostwick. Posh substitute Lee Angol in action at Scunthorpe. Photo: Joe Dent/theposh.com. Tom Nichols: (for Morias, 80 mins).